Answer: Those “silver linings” are the same stuff the rest of the cloud is made from — tiny droplets of water that formed on particles of dust in the air. All clouds are formed in this way. Of course, clouds caused by dust storms or forest fires are another thing entirely. What we’re talking about here are your normal “water” clouds. And what makes the silver lining shine is direct light from the Sun. The photo above was taken during this year’s monsoon season, when normal clouds are plentiful. You can tell by the brightness of the sky that the Sun is right behind that cloud. 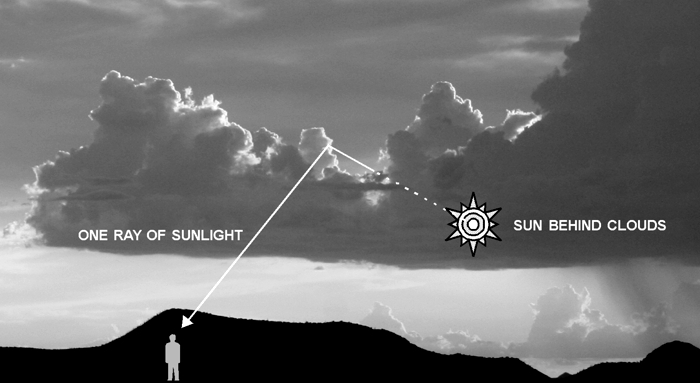 When the angles are just right, light from the Sun will reflect from the edges on the cloud and scatter forward to the lucky observer. The dark part of the cloud is, basically, in its own shadow. The silver lining, however, is lit by the full brightness of the Sun. Regarding the old adage “Every cloud has a silver lining” … unfortunately, that’s just not true, in meteorology or in life. If the Sun is not behind the cloud, you just can’t get this effect.